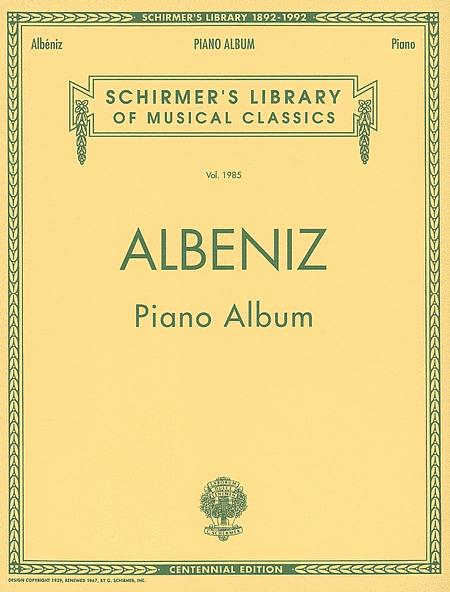 Schirmer Library of Classics Volume 1985 Piano Solo. Composed by Isaac Albeniz (1860-1909). Piano Collection. Contemporary, Classical. 96 pages. G. Schirmer #LB1985. 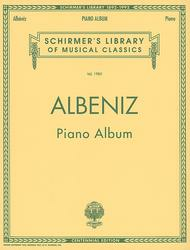 Published by G. Schirmer (HL.50482098). Isaac Albeniz is one of Spain's most important composers and pianists, the first of the famous three of the 19th century (including Manuel de Falla and Enrique Granados). Prior to this collection, most print music available was from UME. It contains 13 of his most beloved piano works. Contents: Azulejos, Op. post. (Glazed Tiles) * Cordoba, Op. 232, No. 4 * El Puerto (Iberia Suite) * En la playa (At the Beach) * Evocation (Iberia Suite) * Granada * Malaguena * Minuetto del gallo (Rooster Minuet) * Preludio (Prelude): Cantos de Espana (Songs of Spain) * Preludio (Prelude): Espana, Op. 165 (Spain) * Seguidillas, Op. 232, No. 5 * Sevilla (Sevillanas) * Tango. I am really enjoying the piano pieces in this album. I was able to play "Granada" fairly easily" and I love the guitar-like sound in the "prelude" of Cantos de Espana. Some of the other pieces will take more time to learn.